Conduct an Active Traffic Demand Management (ATDM) Study to improve capacity and travel time for all users within the existing I-71/75 right-of-way during peak AM and PM travel times. Consider low-cost, short-term, innovative measures both as individual and combined solutions. Potential options that the study would example include, but not limited to: high-occupancy vehicle (HOV) lanes, truck only lanes, variable speed limits, ramp metering, and bus on shoulder. High Occupancy Vehicle (HOV) Lanes. Striping and signage for HOV lanes encourage carpooling and transit usage by requiring a minimum number of occupants in a vehicle during a designated time of day. The remainder of the day, the lane would be open for all vehicles. HOV facilities offer a substantial savings in travel time and a reliable and predictable travel time. In general, carpoolers, vanpoolers, and bus patrons primarily benefit from HOV lanes by allowing them to move through congestion. Truck Lane Restrictions and/or Truck Only Lanes. Due to heavy cargo weights, trucks are unable to maintain constant speeds through this corridor. This problem is exacerbated during peak, high congestion periods of stop-and-go traffic. Having trucks restricted to one or two lanes could potentially assist commuters to maintain a more constant, although at reduced speed, flow. Variable Speed Limits. Variable Speed Limits have been approved by the Ohio Department of Transportation to temporarily lower speed limits to address inclement weather, congestion, road construction, and other factors that can affect the safe and orderly movement of freeway traffic. For periods of high congestion, variable speeds can help maintain a constant, although slow, flow of traffic. Ramp Metering. Ramp meters are traffic signals on freeway entrance ramps that release one or two vehicles at a time. By regulating flow of traffic onto the freeway, ramp meters can break up large platoons of vehicles to make it easier and safer for motorists to merge onto the freeway. Ramp meters have been shown to improve travel times by up to 60% and reduce crashes by up to 50%. Identification of the most efficient and cost effective means of improving capacity and travel time for all users within the existing I-71/75 right-of-way during peak AM and PM travel times. TANK buses will have the ability to bypass traffic congestion and improve travel time and reliability. Improved travel time and reliability may incentivize the use of transit and increase ridership. Added transit ridership could create additional funding and public support for TANK to install additional buses for even higher-travel time frequency to/from critical Boone residential and employment hubs. Reduction of Green House Gas (GHG) emissions by reducing vehicle traffic idling and the number of Single Occupant Vehicles (SOV) through increased transit and ridesharing trips. Increases Boone County employers’ ability to attract and retain employees by widening the regional pool of potential workforce candidates through increased accessibility. A legislative process will be necessary in order to implement bus on shoulders in the state of Kentucky. The entire length of I-71/75 in the OKI region is severely congested. Combined southbound and northbound I-71/75 Average Daily Traffic (2015) at KY 536 interchange is 111,023 and Brent Spence Bridge is 152,223. I-71/75 is currently operating at a Level of Service “F” and is projected to remain “F” in year 2040, if no improvements are made. TANK’s eight express routes serving Boone County operate along the I-71/75 corridor and are susceptible to delays caused by peak-period traffic congestion. Existing and future data does not identify a safety-related concern for this segment of I-71/75. I-71/75 is part of a national corridor connecting Detroit to Miami. More importantly, it is the life blood of the OKI Region linking areas of huge employment density for the region including downtown Covington, CVG and cities of Florence and Walton. CVG’s active development and lease of airport property to companies such as DHL Express and Amazon Air Prime will continue to add employee and truck travel demands upon the I-71/75 corridor. The Boone County and Northern Kentucky Area Planning Commissions project commercial land use will increase around the I-71/75 interchanges with I-275 and KY 236 due to the redevelopment of the Erlanger Cinemas and Marydale properties. A variety of established, dense urban and suburban residential neighborhoods flank I-71/75 and provide various housing options from single family on less than one acre lots to multi-family, rental properties of 10 or more units. The corridor contains a large Environmental Justice population including residential areas with 20 percent to 40 percent concentrations of elderly, disabled, low income and zero car households. Several public comments voiced their appreciation for existing transit and support for expanding transit as a means of addressing Boone County traffic. 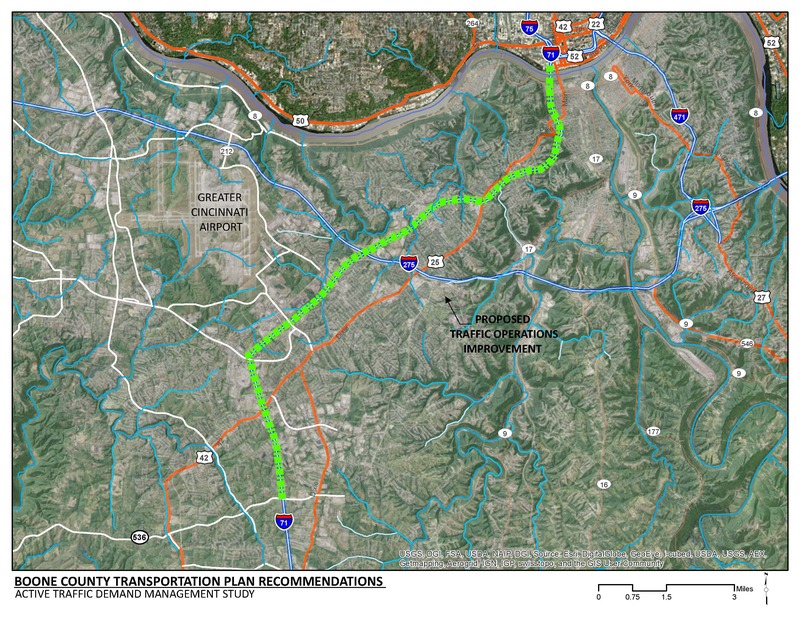 An initial examination of widths for the inside shoulders of north and southbound I-71/75 from the Brent Spence Bridge to Florence Mall in Boone County showed that there are, at minimum, four interstate bridge crossing with widths of less than 12 feet (9th Street, KY 1120 (12th Street), Rivard Drive, and Beechwood Road).